April 1943. "Baltimore, Maryland -- peanut stand." Medium format nitrate negative by Marjory Collins for the Office of War Information. View full size. Submitted by EvenSteven on Wed, 03/29/2017 - 6:33pm. Baltimore and Peanuts have a history with me. I'm a Baltimore native who as a young child (1950's) would go with my mother as she paid our utility bill at the Baltimore Gas and Electric Company Building at 39 West Lexington Street. The highlight for me was that this little patch of Charm City was also occupied by a Planter's Peanut Man in full peanut costume who gave away peanuts. It didn't even matter to him if you came back for seconds or thirds which I always did and of course I had Mom get a handful too. There was handicapped man one would see at various places downtown who was a veteran of WWII who traveled on a skate board with his legs under him and sold 5 cent bags of peanuts. 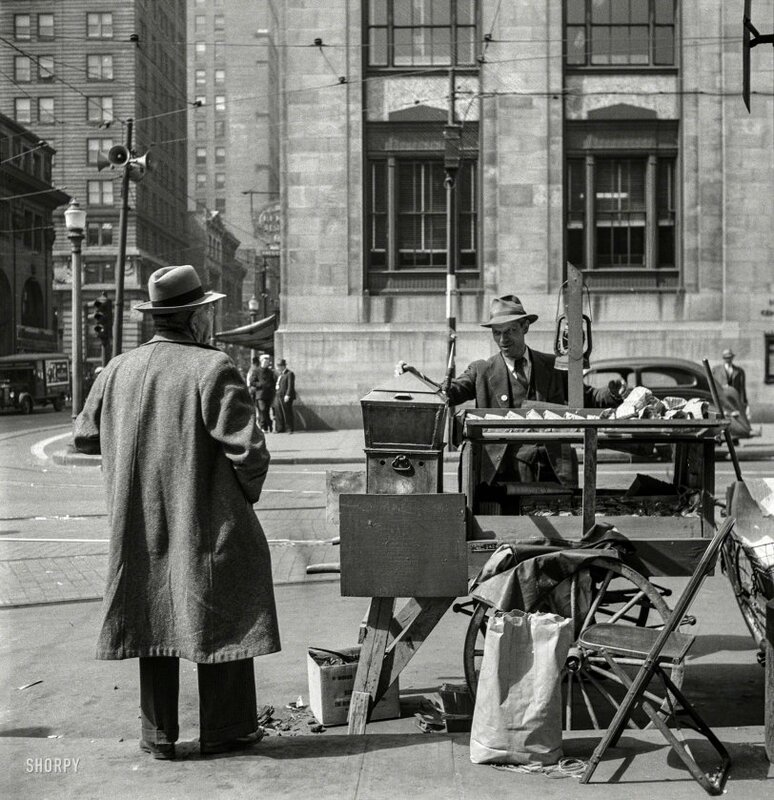 Another place to visit and enjoy the great smell that made your mouth water was the Geppi roasted peanut stand in the Lexington Market. And last but not least was the peanut vendor who stood near Blaze Starr's Two O'Clock Club on the infamous Baltimore Strip selling his peanuts with a sing song ditty .. " Hey get your hot nuts. Get'em from the peanut man." Submitted by PersonFromPorlock on Wed, 03/22/2017 - 5:14pm. I seem to recall speakers like that in 'B' movies of the 1950s, being used to warn the public to take cover from the Space Aliens or Mutant Critter. So probably they did originally have some Civil Defense function. Submitted by JellyBelly on Wed, 03/22/2017 - 11:49am. of the intersection of E. Baltimore St. & Holliday St.
in the photo still stands. Submitted by SteveLexington on Tue, 03/21/2017 - 7:46pm. I wonder what was the purpose of the array of speakers mounted high on the utility pole on the corner. Wartime public address system? Air raid signal? A day in the life of a peanut vendor. Submitted by BillyB on Tue, 03/21/2017 - 8:58am. A very interesting picture of how things were. It shows all the little things needed to make it through the day. From the box of wood scraps for the roaster to the chair and newspaper for when thing got slow to the lantern for night visibility and a bag of peanuts waiting to be roasted. I also see a broom for keeping the area clean and the city off his back. Modifications appear to have been done as he found scraps of wood.